This audiobook is narrated by Tom Hanks. I am a Tom Hanks fan because he seems like a genuinely nice guy. These seventeen short stories are just what you would expect from a nice guy. There were a couple I didn't enjoy, but overall this is a delightful collection. 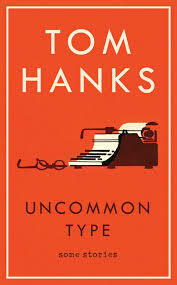 Quirky, thoughtful, and the overriding theme is the typewriter. I was truly charmed. Thank you, I've been wondering about this book. One of my friends shared this book during our Tues session. I plan to listen/read it too. Are you familiar with Tom's app? It's fun!